It's Fall already! The leaves are changing, the chill is in the air, and I picked up my first gallon of apple cider! There are always special flavors and scents that I associate with each season of the year. The taste of S'mores is one of those flavors I always associate with Autumn campfires. This S'mores bar recipe is a simple and quick way to make S'mores for everyone all at once and without the campfire. My sister-in-law, Laura, scouted this recipe out for me and passed it on. I hope you enjoy it as much as I do! 5 (1.55 oz each ) milk chocolate candy bars, Hershey's, of course! Cream butter and sugar in a large bowl until light and fluffy. Add the egg and vanilla and beat well. In a second bowl, combine the flour, cracker crumbs, baking powder and salt; gradually add this dry mixture to the creamed mixture. Once mixed, set aside 1/2 cup to use later for the topping. Press the rest of the mixture into a greased 9 inch square baking pan to form a crust. 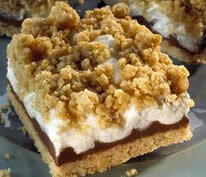 Line the unwrapped candy bars across the crust and then spread the marshmallow cream on top. Finally, sprinkle that leftover graham cracker mixture over the top. Bake for 25-30 minutes in a 350° oven until golden brown. Allow to cool on a wire rack (I'm sure you'll remember that marshmallow can get pretty hot, so don't dive in too soon). Cut into bars and store in an airtight container if you aren't serving immediately or if by some strange phenomenon you have any left! Depending on the size you slice them, you can get up to 18 squares per batch. If you cut them to that size, here's the nutritional facts: 1 bar equals 213 calories, 9g fat, (5g saturated fat) 28 mg cholesterol, 114 mg sodium, 30 g carbohydrate, 1 g fiber, 3g protein. Diabetic Exchanges: 2 starch,1 fat. I need your help and creative juices! We're putting together a special project this fall - a digital dessert cookbook. The dessert cookbook will contain the tried and true recipes of chocolate lovers around the world. Each recipe will be illustrated with step by step photos of the process from the ingredients used to the finished masterpiece. Be sure to include fun facts about your recipe when you make your submission. I always enjoy hearing the story behind the recipe, like where you found it, what special occasion you tend to make it for, any special memories associated with the dessert or candy making process. Don't forget to include your name (or initials if you're shy) and location on the globe. I can't wait to see what you've got to offer! 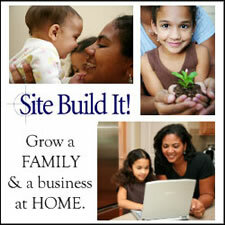 Just send your submission to us at angie(at)chocolate-candy-mall.com. This is the LAST DAY to get your free sample chocolate candy bars from Mars! Head on over to Mars' Real Chocolate website and sign up for your own free candy bar coupon. Thanks, Mars, for keeping us in candy bars this summer! I hope you enjoyed this issue of Charmingly Chocolate with the mouthwatering S'mores bars recipe for fall and the free sample chocolate candy reminder. If you have any feedback or comments you'd like to share with me, just reply to this zine and let me know. 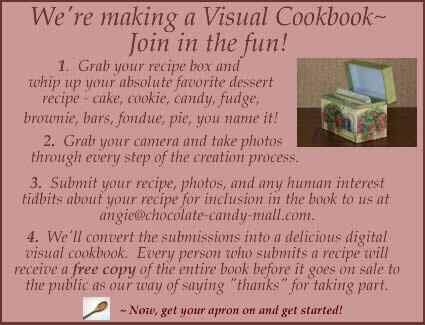 And don't forget to get your recipe in for the visual desserts cookbook!